Summertime is great, nobody would argue with that… would they? Nobody except, perhaps, your lawn. Lack of water and extensive summer use can leave your turf parched, compacted and in need of some serious TLC. 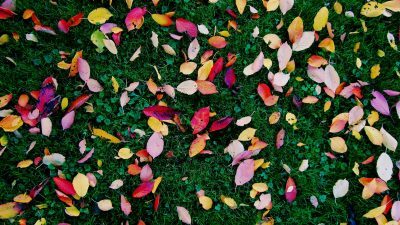 It’s natural to expect a bit of die back on your lawn through the colder, darker months, but with a couple of preventative measures now you can keep it in the best shape possible. During the autumn, it’s time to make some final checks on certain areas of your garden to make sure you’re prepared for the colder months. September is a great time of year for spending a bit of extra time on your lawn, and preparing for the ravages of winter can help keep it tip-top all year round. Moss takes up valuable space and nutrients on your lawn, so get rid of it when you spot it. Moss likes shade and damp, so check round the base of any trees and hedges. Apply a moss killer – I like to use bicarbonate of soda as it’s natural and doesn’t harm the environment – and leave for a week or so until the moss has died. Then, rake the lawn clear with a wide spring-tined lawn rake. You can add all the raked up material to your compost heap if you have one (more on that later!). It’s a good idea to aerate the surface of your lawn with a garden fork in order to improve drainage and get rid of the damp environment that moss likes. Dig your fork into the ground and gently ‘wobble’ back and forth to create some long, slim channels into the soil. Repeat this at intervals of about 10cm all the way across your lawn, then scatter a sandy top dressing across the soil. This will fill the holes you’ve just made, and create porous patches so that water can drain through the topsoil easier. Bags of ready-made sand top dressing can be picked up cheaply at your local garden centre. 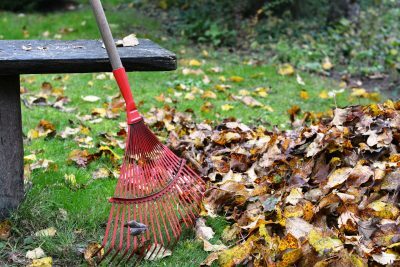 A thick layer of fallen leaves, known as ‘thatch’, will smother your grass and prevent light getting to it, so it’s really important to keep on top of raking. On the plus side, they’re great to add to your compost heap and they break down pretty quickly. Read my article on building your own compost heap here. Finish off all your good work by treating your lawn to a good feed. It’s important to use a specific autumn feed at this time of year, which is high in potash and phosphates to promote strong root growth. This will lead to vigorous, healthy leaf growth over the spring months. Don’t be tempted to use a spring feed at this time of year, because they promote new shoots which are easily damaged by frosts over the winter months.